It's important to understand your ZYDELIG dose and to take your medication exactly as prescribed. *Pills and bottles not shown at actual size. What if you miss a dose of ZYDELIG? 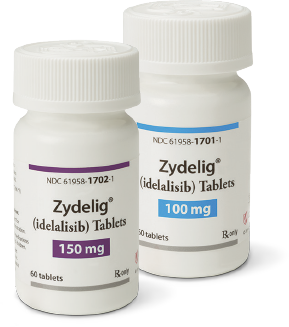 Take ZYDELIG exactly as directed by your doctor. Take ZYDELIG whole, with or without food. Try to take ZYDELIG at the same times every day (setting reminder alarms can help). Give your doctor and pharmacist a list of all the other medicines you're taking, and inform them of any medication changes. Store ZYDELIG at room temperature, in its original container, and ALWAYS out of reach of children. Report side effects to your doctor or nurse as soon as possible. You know what is normal for you, so be sure to report anything that seems out of the ordinary at any time while taking ZYDELIG—even if it isn't a side effect listed on this website. Don't change your ZYDELIG dose without first talking to your doctor. Don't stop taking your ZYDELIG without first talking to your doctor. Don't take prescription and over-the-counter medicines, vitamins, or herbal supplements without first consulting your doctor. Some of these may interact with ZYDELIG. Don't use your ZYDELIG if the seal over the bottle opening is broken or missing. Side effects may occur when you take ZYDELIG.